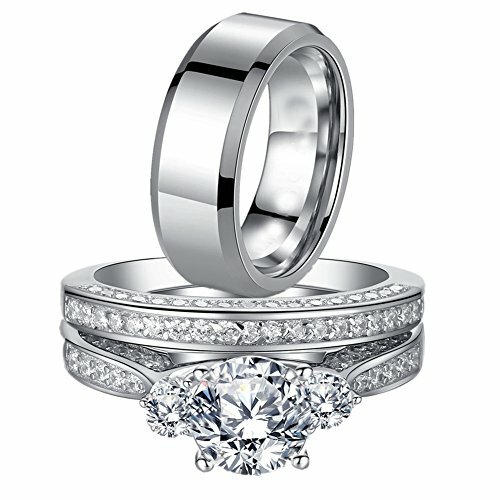 This is a beautiful 3 pieces top quality CZ wedding engagement ring sets for him and her. The feature of the womens wedding ring set is a 7*7mm (1.25ct) round cut stone in center with a prong setting and come with band. It's an AAA grade cubic zirconia stones with high clarity and refraction. The metal of women's ring is made from sterling silver jewelry. The metal of men's ring is made from Stainless Steel. The ring is 8mm of width and 2-2.5mm of thickness. Remove Jewelry During Tasks - When performing manual tasks, remove your jewelry to prevent physical damage or exposure to chemicals or cleaning fluids. Some tasks that should be avoided when wearing jewelry include kitchen work, gardening, cleaning the house and other common tasks. Put Jewelry On After Applying Makeup - Cosmetics, hairspray, perfumes and lotion can contain chemicals that can often damage jewelry. Putting jewelry on after applying these materials will limit exposure to jewelry and any potential damage. Womens wedding ring set:rhodium plated over 925 sterling silver to prevent tarnishing,Mens Stainless Steel matching band,never turn green,nickel Free. Simulated diamond cut craftmanship makes the stones' sparkle of the women cz wedding ring set come closer to real diamond! This couple cubic zirconia rings come with a FREE Ring Box!! 60 DAY MONEY BACK GUARANTEE: 100% satisfaction and money back guarantee. We offer a 60 days return policy with NO restocking fee. If you have any questions about this product by MABELLA, contact us by completing and submitting the form below. If you are looking for a specif part number, please include it with your message.